You are currently browsing the archives for the tag 'Abrakadabra'. After the Louis Vuitton S/S 2013 show during Paris Fashion Week, I spotted Natasha Zinko, a London-based designer of Russian origin that graduated with a BA Honours recognition for Jewelry Design at Central St Martins. She opened her first store this year in the heart of London’s Mayfair district at 46 Maddox Street. 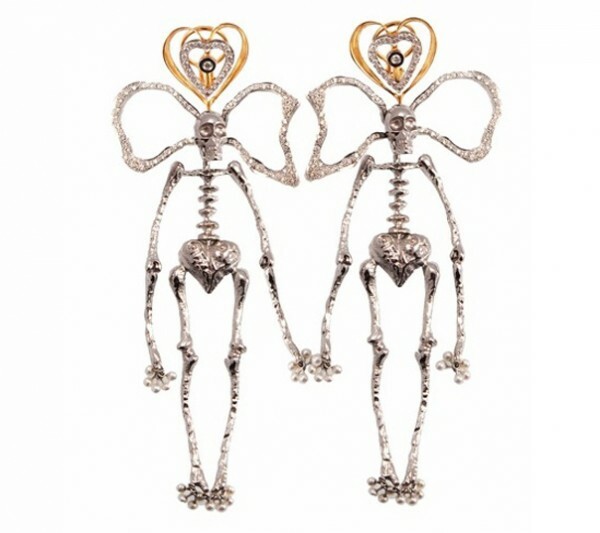 Her jewelry creations, like these skeleton earrings, are bold and very fashion forward. She also designs a ready-to-wear line called Abrakadabra. Of course, she caught my eye immediately because of her stunning Mary Katrantzou dress. Her friend wore head-to-toe Prada from the F/W 2012 collection. If you are interested in my look, click here for the previous post. Natasha’s look: Typewriter dress by Mary Katrantzou (F/W 2012), embroidered book clutch by Olympia Le-Tan, shoes and skeleton earrings by Natasha Zinko.